CITY TRAFFIC SIGNS FLOOR MAT home decor, jewelry, decor, decorations, electronics, fountains, floor mats, art glass, vases, garden essentials, fireplace screens. Bring a touch of the city inside your home with this vibrant floor mat. 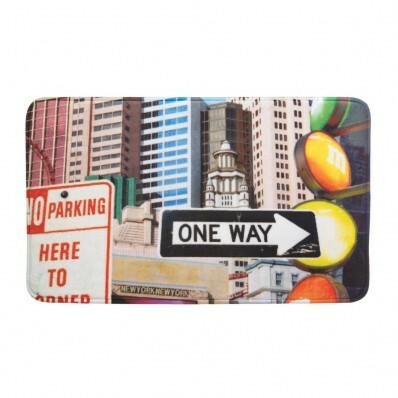 Made from polyester and printed digitally, this scene of tall buildings and colorful traffic signs is a cool and comfortable way to add urban style to any room. Machine wash cold; do not bleach; do not iron; do not tumble dry; do not dry clean. Material(s): POLYESTER POLYURETHANE MEMORY FOAM FELT. Dimensions 29" x 17" x 0".